Noble Realty is owned and run by Stephen Noble right here on Taveuni. Originally from Canada, Stephen has been resident on Taveuni for almost 22 years. In that time he has gained a wealth of local knowledge and contacts which are now put to use matching potential buyers to their perfect properties in paradise. “For most of my life I dreamed of living on a tropical island. Fortunately for me, and only after searching much of the Caribbean and South Pacific, I finally found the idyllic paradise…..the island of Taveuni located in fantastic Fiji. For the last 21 years I have been blessed to live here in paradise. Much of this time of I have been actively involved with the renovating of my home, including electrical, plumbing, and alternative energy projects. My extensive experience in dealing with immigration, Customs, freight forwarding, local suppliers, building contractors etc is knowledge I am happy to share with my friends and clients. I have spent many hours donating my time to special and personally rewarding island projects, including the organising and opening of a Kindergarten school, which I still run after 9 years. In addition I am active member of the Rotary Club of Taveuni, a Fijian Citizen, a licensed Real Estate Agent, and the founder and President of Noble Realty. For priority notification of new listings on Taveuni, Qamea, as well as Savusavu and northern Vanua Levu subscribe to our mailing list. 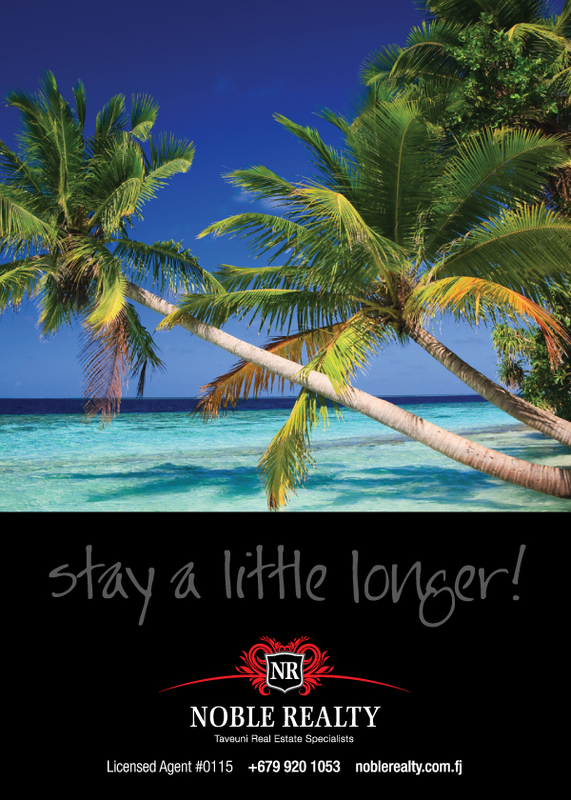 Don’t miss out on finding your own perfect home in Paradise !! For more information on investing in Fiji, and buying and selling property and land, visit our comprehensive FAQ’s Page or our Links Page for useful external websites.